Win a $25.00 Whole Foods Gift Card - Veria TV awarded me several WF Gift Cards as a thank you to the folks that cheered me on and supported me through the "Unlock The Taste of Summer" Cook-Off. Please read below for directions on how to enter. THREE winners will be selected. Go to the Rawfully Tempting Online Cafe. View the list of products, pick your favorite, and come back here and tell us what you like best in the Comments below.. (Be sure to look at the drop down menus for more product options). - Include your FB or GOOGLE ID and email address with the comments in EVERY entry. - PLEASE DO NOT PUT MULTIPLE COMMENTS TOGETHER...WINNER will be randomly selected, so each entry is numbered. If you enter more than one, it must be in a separate comment. That's it, you're done! Simple! 1 - Follow or subscribe to Rawfully Tempting's Blog - Note: If you already Follow RT, cool, that counts, just tell us in 1 comment below. 2 - Become a Rawfully Tempting Friend on Facebook - AND/OR JOIN our Rawfully Tempting Goodness FB GROUP, and let us know in a separate comment below. 3 - Sign up for our Rawfully Tempting Newsletter, and tell us in a separate comment below. Note: If you are already receiving the Newsletter, just let us know in comments below. NOTE: Leave 1 comment for EACH entry in order for it to count. Be sure to include your ID and email address in each comment, so I can contact you if you win. ***Currently, if you make a minimum $50.00 purchase at the RT Online Cafe, we will send you a $25.00 Whole Foods Gift Card with your order. There are 4 of these available, so place your orders while supply lasts! *Every comment MUST have an email address or way to contact you if you win! - Contest begins Sunday, July 31, 2011 at 12:30 AM - EST. Deadline to enter is August 3, 2011 at 11 PM, EST. Winner will be randomly selected and notified via email. Winner must respond within 48 hours, or another winner will be selected. Be sure to leave a valid email address in each comment so I can contact you or your entry will be disqualified. - Must be over the age of 18 to enter and have a valid US or Canadian shipping address. Kelly, Dee and Nancy!!! Your Gift Card is on it's way! 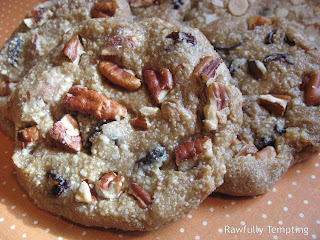 Mmmmm my favorite would definitely be the Pecan Cinnamon & Spice Cookies! Gourmet Chocolate Covered Kale Chips look lovely and delicious! Mmmm.... the Oatmeal Raisein Cookies!! I follow your blog with Goodle Friend Connect! RAWFULLY TEMPTING group follower now! I've never tried chocolate kale chips and am most interested in those right now! The Ultimate Fudge Brownie looks so good! The Ultimate Fudge Brownie looks decadent! I just signed up for your Rawfully Tempting Newsletter. I requested to joined Rawfully Tempting on Facebook! I have signed up for your Rawfully Tempting Newsletter. Pecan cinnamon spice cookies!! Yummmm. I would choose the chocolate chip cookies although the brownies look so good, too. I already get you newsletter. Oatmeal raisin cookies are a classic with me. I have been gluten free for a few years so I am always looking for old time classic recipes that are now gluten free or raw. The cheesy raw kale chips would be amazing to try! I've loved following you on FB! And would love to try your kale chips! !